Cutting the Cords on Your Cameras: What is the Real Cost and What are Your Options? Facebook Live: Is it the Right Platform for Streaming Professionals? How Do I Stream My Live Webcasts in 4K? Stream Dudes is quite honored to be an Authorized Reseller of AJA and is a great resource for product knowledge. 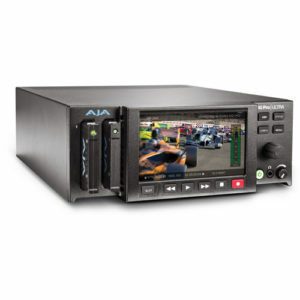 For those of you who might be unfamiliar with this reputable manufacturer, AJA Video Systems is a leading manufacturer of high-quality and cost-effective digital video acquisition, interface, conversion and desktop solutions for professional broadcast, production and post-production. The diverse line of products and solutions offered by AJA make obtaining professional results simple. For instance, Stream Dudes is a big fan of the KONA video capture and playback cards, as they work flawlessly with vMix software and allow users the ultimate in quality and flexibility. With solutions for SD, HD, 3G, Dual Link HD, 2K and 4K, KONA makes video production workflows simple, but yet robust. For those seeking an external device that is just as capable, the entire family of Io video capture devices (Io 4K, Io XT, Io Express) come highly recommended by the Stream Dudes team. As like all AJA products, they strike offer unparalleled versatility, professional results and are straightforward in operation. Perhaps the most popular family of products is the Ki Pro line of recording and playback devices. The entire Ki Pro family (Ki Pro Ultra, Ki Pro Quad, Ki Pro Rack, Ki Pro, Ki Pro Mini) offers extensive video and audio connectivity, making it simple to interface with virtually any type of camera you might own or rent. The Stream Dudes team has witnessed Ki Pros in action firsthand, and although they are a truly professional-grade product, they are still intuitive to operate (VTR-like buttons combined with an easy-to-understand user interface) and well-priced. Simplicity and value are also what make the KUMO line of SDI video routers a top pick of team.Built for critical production environments, KUMO Compact SDI routers offer quality that exceeds SMPTE specifications, but at an unprecedented price. Available in three configurations (KUMO 3232 supports 32 3G SDI I/O, KUMO 1616 supports 16 3G SDI and KUMO 1604 supports 16 3G SDI inputs and 4 3G SDI outputs), KUMO has most video routing needs easily covered. For full control without the need of a computer, Stream Dudes recommends adding the KUMO CP (control panel) to your workflow. Their commitment to providing video professionals with “future-proof” workflow solutions is good reason why Stream Dudes gets behind AJA in a big way. The new CION 4K/UHD production camera offers producers with the opportunity to easily shoot 4K, but should their current workflow only call for HD, then the CION can be easily adjusted down to 1080p. From the FS family of frame synchronizers, frame rate and format converters, to the powerful TruZoom for real-time scaling of 4K footage, broadcasters and media professionals are constantly relying on AJA gear to offer adaptable and simple workflows. Bridging the gap between devices is always a bit of a challenge. Luckily AJA Mini-Converters offer the most complete range of compact, standalone, converters available. Whether it be 4K, HD, SD, SDI, HDMI, Fiber or any points in between, AJA Mini-Converters have a solution to fit almost any workflow or need. Like all AJA products, the Mini-Converters are solidly constructed and thoroughly tested for reliability and consistency. Stream Dudes offers a full lineup of AJA products, designed to complete your video production workflows. To learn more about customized solutions or to purchase AJA Video System products, Contact Us for more information.